Here are a set of example models that demonstrate the capabilities of NFsim, most of which are included with the NFsim distribution. If you would like to contribute and highlight any of your own example models, please send us a message through the feedback page. 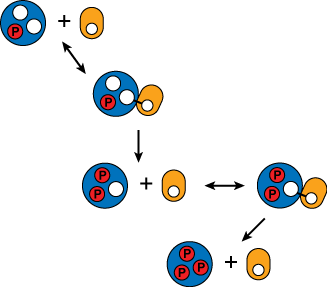 Many proteins can be phosphorylated and dephosphorylated at multiple sites to control their function, but simulating the reaction dynamics of molecules with more than just two or three sites is challenging. NFsim can effeciently simulate proteins with as many sites as you want to consider, which we demonstrate with a suite of example models. Cells are filled with molecules that can polymerize. One example is Actin, a cytoskeletal protein that rapidly polymerizes into branched patterns to control eukaryotic cell shape, motility, and processes such as endocytosis. 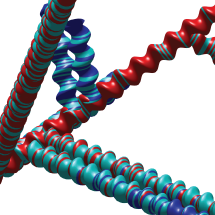 NFsim provides an ideal platform for constructing models of polymerization dynamics. a.k.a., Trivalent Ligand, Bivalent Receptor (TLBR) system. This classic model system has been used to understand how immune system receptors aggregate when they are crosslinked by mutual binding to the same ligand or antigen. 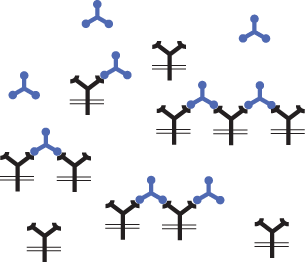 Aggregation of receptors can eventually activate downstream signaling, so the dynamics of aggregation are important to understand. Due to the complexity of aggregation, very few biochemical simulators available today can handle this system. NFsim is one of them, and can do it rather effeciently. Bacteria can sense and swim towards food using thier chemotaxis sensory system together with flagella. The receptors that sense food can assemble into highly cooperative clusters that can amplify weak signals by switching between on and off states. To simulate the details of receptor activity, you need to introduce a functional expression for the coopeartivity that can be applied to the receptor clusters. Researchers have built custom simulators that can do this (and only this), but NFsim is the only general biochemical reaction simulator that solves this problem and can simulate cooperative receptor activity. Many large molecular structures are complicated and not well understood, but modelers can often approximate their function with a simple equation, such as a Hill function. NFsim allows you to do write any mathetical function you like and use it directly in your model to control the rate of a reaction rule. 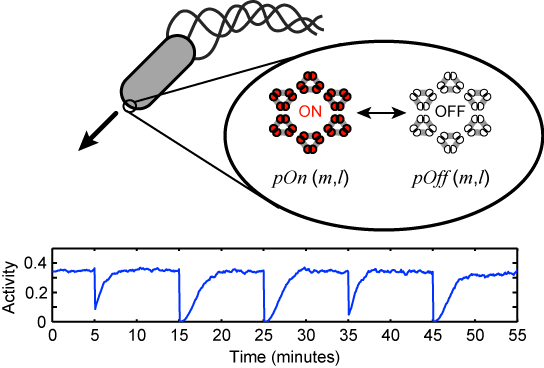 For example, you can write a funciton that captures the dynamic switching behavior of the bacterial flagellar motor. 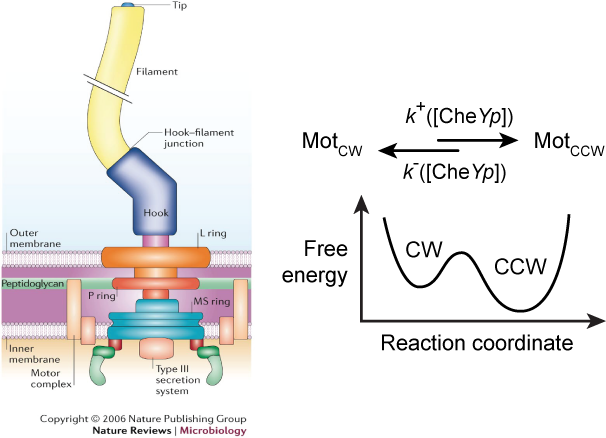 This allows modelers to quickly connect coarse-grained representations of complex behavior, such as the motor, to the rest of your biochemical reactions. Large signaling pathways, such as Fcε-RI signaling in immune cells, can involve hundreds of different molecules that can interact, aggregate, and modify each other. Standard simulators force the modeler to consider all distinct chemical species, so modelers generally have to make simplifications. In NFsim, models never have to enumerate or generate the list of all chemical species, so you can simulate systems like Fcε-RI in detail.